Colombian police have seized property worth an estimated $100m in raids aimed at a major cocaine cartel. The luxury homes, farms and commercial property seized are thought to belong to Hernando Gomez Bustamante, boss of the Cali-based Norte del Valle gang. Information supplied by gang insiders and rivals apparently led to the raids. Elite police conducted the operation, which comes as the estimated death toll from six months of clashes between Cali's rival gangsters tops 1000. The BBC's Jeremy McDermott in Bogota says rival leaders in the Norte del Valle cartel have declared war on each other. As well as carrying out attacks and assassinations, gang-members have been leaking information to the security forces so that rivals can be killed or captured. Our correspondent says the police have been stunned by the quality of intelligence they are receiving. Mr Gomez Bustamante - better know by the nickname "Rasguno" - meaning "Scratch" - is believed to be in hiding. He is said to be at loggerheads with another Norte del Valle kingpin, Diego Montoya Sanchez, alias "Don Diego". 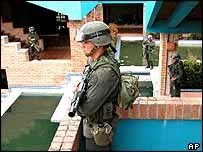 Norte del Valle took over much of the cocaine trade in the Cali area after the disbanding of the Medellin cartel headed by the notorious Pablo Escobar. The elite police unit that killed Mr Escobar was recently revived by the Colombian government. Officers from the highly-trained, heavily-funded Search Bloc team played a key role in the raid on Mr Bustamante's assets. While the Norte del Valle bosses - wanted for extradition to the United States - remain at large, their confiscated property is expected to provide a vital boost to Colombia's state coffers. Our correspondent says the assets will become government property if the state can prove they were bought with drug money. Norte del Valle, based in south-west Colombia, is the last of the civilian drug cartels. Along with Colombia's left-wing guerrillas and right-wing paramilitaries, it is responsible for some of the 800 tonnes of cocaine and 10 tonnes of heroin that leave Colombia every year.